Minnows Go Round FC and newly promoted side Kada City both scored shock victories away from home as Mfon Udoh scored his sixth goal of the season and Katsina United had two players sent off on an action-packed Matchday 10 which featured a full complement of matches for the first time in the 2018/2019 Nigeria Professional Football League (NPFL) season. All twenty-two clubs in both Groups A and B of the abridged season were in action on the same Matchday for the first time this season and twenty-two goals were scored with Group B in particular producing results that were nothing short of astonishing. Go Round FC, who inflicted a first-ever opening day defeat on Abia Warriors on Matchday 2 for their first ever away victory in the league, showed that result wasn’t a fluke when they beat newly promoted Gombe United one-nil at the Pantami Stadium in Gombe. Henry Ochuba struck in the seventh minute for the Omoku side who then held on for the rest of the match to secure a second victory away from home for the season despite losing Akaba Otega to a red card in the 90th minute. Kada City were shock 1-0 victors over Plateau United in the day’s other away victory in Group B. Kada who had won just two games all season and had taken just one point away from home with their last away match a 4-0 drubbing at Akwa United celebrated being transferred to the Delta State government with an upset of the 2017 NPFL champions. Sadiq Suleiman scored the winner in the 81st minute for the away side who lost Shola Collins to two yellows in the 90th minute. Abdu Maikaba blamed “psychological pressure” for his side’s capitulation but Kada won’t care. Isah Ndala scored the only goal as Nasarawa United beat Yobe Desert Stars 1-0 at the Lafia Township Stadium while Mfon Udoh scored for the fourth game running to give Akwa United a 1-0 victory over Group B leaders FC Ifeanyi Ubah in Uyo. Udoh who holds the record for the most goals scored in a season in the NPFL with 23 had hit the bar in the second minute before sashaying past three defenders to slot in the winner in spectacular fashion in the 40th minute for the Promise Keepers who have now won four of their last five games after failing to win any of their opening four games. Two old war horses Gambo Mohammed and Rabiu Ali rolled back the years to give Kano Pillars who welcomed burly striker Nwagua Nyima back to the starting line up after a short sojourn in search of a foreign club a 2-0 win over Abia Warriors at the Sani Abacha Stadium in Kano. Musa Ahmed had a hand in both Pillars’ goals as he set up Mohammed for the opener and was fouled for the penalty scored by Ali. In the final Group B game, El Kanemi Warriors maintained pace with FC Ifeanyiubah at the top of the table when they dispatched visiting Heartland FC 2-0 in Maiduguri. Warriors occupy the second position on 18 points level with FC Ifeanyiubah but with an inferior goals difference of +2 to the leaders’ +4. 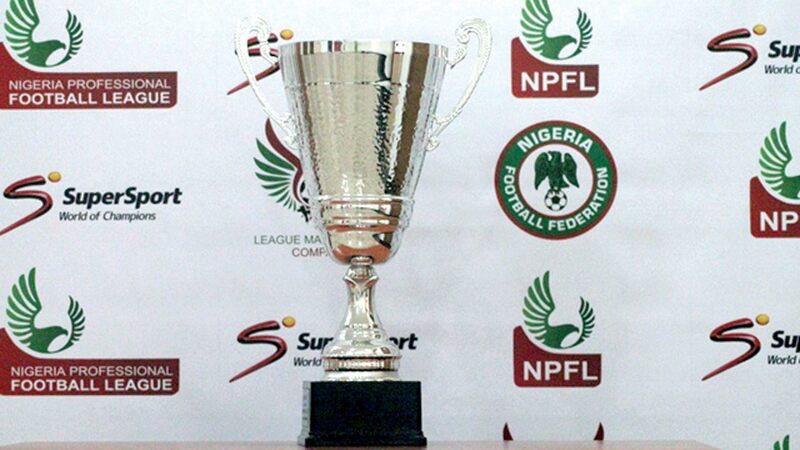 In Group A, MFM earned bragging rights in the South West Derby against Sunshine Stars at the Agege Township Stadium with a 2-0 victory to maintain their lead at the top of the table. Adeniji Kabir struck his fourth of the season for the Olukoya Boys and then contrived to miss from about six yards in the second half when scoring appeared a lot easier. Michael Ohanu rounded off the scoring for MFM with a cheeky flick for his second goal in as many games. Katsina United lost two players to red cards in a startling display of indiscipline in the first half where they conceded twice against Enyimba at the Enyimba Stadium Aba. Chinedu Ajanah got an early bath in the 21stminute before Enyimba defender Ifeanyi Anaemena put the home side ahead from the spot after Thomas Zenke had been fouled in the box. Dominic Abbah then got sent off in first-half added time for a dangerous lunge on Abdulrahman Bashir – scorer of Enyimba’s second goal in the 60th minute. Yaya Kone’s brace gave Lobi Stars a 2-1 victory over Remo Stars at the Aper Aku Stadium in Makurdi which was the same result recorded in Enugu where Ranger defeated Wikki Tourists 2-1 at the Nnamdi Azikiwe Stadium. Former Super Eagles striker Michael Uchebo bagged a goal and an assist for the Flying Antelopes while Abba Umar grabbed a consolatory effort for Wikki. Nosiru Afees and Lukman Binuyo were on target in Ilorin as Kwara United beat Niger Tornadoes who remain firmly rooted to the bottom of Group A and they are joined in the relegation places by Bendel Insurance who could only manage a 1-1 draw against Rivers United at the Uniben Sports Complex, Benin.